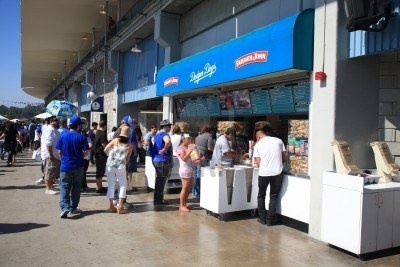 They may be much smaller than a brick and mortar restaurant, but concession stands should be treated and equipped just like any other eatery. One Fat Frog Restaurant Equipment understands this. At one sporting event, one day at an ice skating rink, one concert, etc. , a concession stand can serve as many customers as any other traditional restaurant out there. if you’ve got your own concession business or have been thinking about starting one up, then let One Fat Frog Restaurant Equipment help it be as successful as possible! We our Florida’s largest dealer in high volume commercial restaurant equipment and through our financing program, it’s easy to get everything you need! One Fat Frog Restaurant Equipment has got everything you need for a successful concession stand including warmers, rotisseries, microwaves, griddles, fryers, broilers, equipment stands, refrigerated chef bases, hot dog roller, coolers, undercounter coolers, stainless steel tables, and more! We’re getting more stuff in every week so check back often! One Fat Frog Restaurant Equipment also welcomes quick cash deals and package deals on any pieces of used commercial restaurant equipment you may need for your concession stand. One Fat Frog Restaurant Equipment is the only dealer in the Sunshine State that delivers to nearly the entire state absolutely free! Every day our delivery crew is tearing up the streets of Florida, leaving behind a trail of used restaurant equipment in their wake. This free delivery offer goes free all points in between Orlando, Sanford, Ocala, Gainesville, Jacksonville, Miami, Melbourne, Ft. Myers, the Beaches, Tampa, and more! Call to find out when we’re burning up the road in your neighborhood next! To help you save even more money for your concession stand, One Fat Frog Restaurant Equipment offers free gas conversion, free custom cutting boards, and free custom paint jobs on any piece of commercial restaurant equipment that can be painted. One Fat Frog Restaurant Equipment wants to help you have a successful and dynamic concession stand! Come on in today!